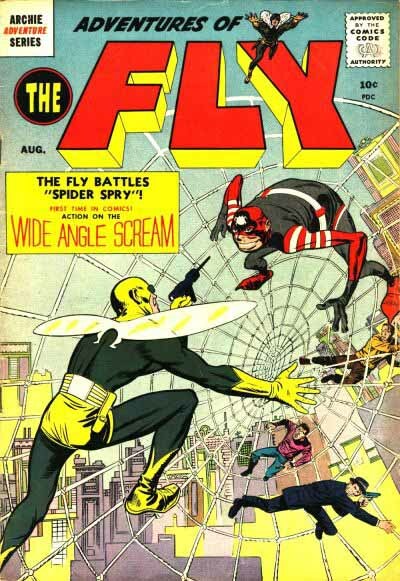 ADVENTURES OF THE FLY was part of a line of superhero comics published by Archie in the 1950s-1960s. Early issues featured art by Jack Kirby, as on this cover. Archie Comics always had an uneasy relationship with their superheroes, though, perhaps rightly feeling that they didn’t fit well with their regular Archie Andrews line of teen humor books. They would try them for a while, let them die, then try them again in some other way. I enjoyed reading the few issues of THE FLY that I found as a kid, as well as early issues of THE SHIELD, also by Kirby. 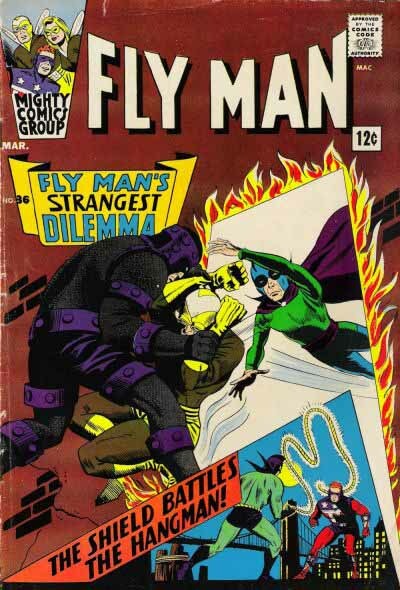 Later the books tried to imitate the success of Marvel Comics with covers like this, The Fly had become FLY MAN. Another, more obscure Archie superhero called THE HANGMAN had his only cover feature on this issue. He was a sinister character perhaps fashioned after Batman, while The Fly reminded me more of Hawkman. Archie tried some of their superhero characters again in the early 1980s under their Red Circle imprint, which was largely created by Grey Morrow, and featured a more horror/mystery approach. That only lasted a short time. In 1988 I was contacted by a new editor at Archie who was planning a relaunch of their superhero characters, but in an even more horrific incarnation, along the lines of Alan Moore’s SWAMP THING, I think. He commissioned some logo sketches from me, of which I still have only two. Here’s the first. The text reads: Here’s a beefed-up version of Len’s sketch. Couldn’t find any pictures of a real noose, but it has to be a slip-knot, which is simpler than this, and looks too small. This LOOKS right, but is it? Note that finding a picture of a noose would no doubt be simple today with Google. The Len mentioned is Len Wein, who was slated to write some of the books, and must have submitted a logo sketch himself, which I adapted here. Also written above are the notes “straight” and “without curve”, probably from the editor. Here’s the other surviving sketch. The notes read: FLY SKETCH #3 REVISED. What I’ve done is narrow the “wings” a pit, and made the “T” symmetrical. If you hold this at a distance, you’ll see the heavy line carries the letter shape. Pretty wonky look, eh? How about that fly head on the H? I’m sure I was asked to make it creepy, don’t know if the fly parts were my idea or not. The entire project fell through not long after these were produced when management at Archie had a look at what had been done, and dumped it as not a good fit for their line. I still like the Hangman logo idea, but am glad The Fly one never saw print, as I now think it looks pretty awful. Archie later licensed these characters to DC, who used them as part of their IMPACT line in the early nineties. As far as I know they haven’t been seen since. Wish someone would reprint the early issues of ADVENTURES OF THE FLY and THE SHIELD, I’d buy that collection. This entry was posted in Logo Studies on September 23, 2007 by Todd. You’re quite right that pictures of nooses are easily found online. Here’s the image source for Google’s top hit, for instance. Actually, Archie HAS published paperbacks of some of the old Fly and Shield comics in the last few years. Do a search on Amazon, I’m sure you can still find them. Thanks, Blake. I thought that might be the case, now I’ll have to see if I can get them. Is it me or does the ‘H’ in the rough for “The Fly” look vaguely testicular with the compound eyes and probiscus located between the legs of the letter?